Valve has confirmed the authenticity of a leaked list of Xbox 360 Achievements for Left 4 Dead 2, indicating that the final two campaigns leaked this past weekend are the real deal. A few days ago, on Sunday, October 11th, we reported that a Taiwanese gaming site had leaked what were purportedly the then-unknown final two campaigns for Left 4 Dead 2. 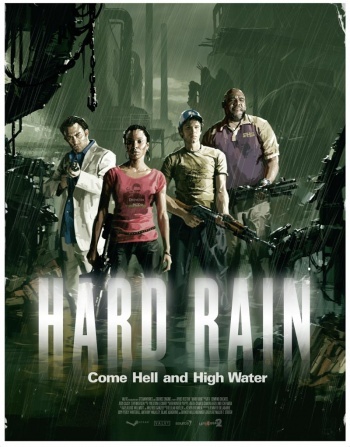 On the one hand, we had Dead Center, a zombie kill-a-thon set in a giant mall a la Dead Rising or Dawn of the Dead, and on the other we had Hard Rain, which looked to be in some sort of flooded industrial setting (not to be confused, of course, with Heavy Rain or Chocolate Rain). While it looked pretty official, it was still only a rumor - until now. Xbox360Achievements managed to get their hands on the full list of Xbox Live Achievements for the upcoming zombie-shooter sequel, a list which Valve's Doug Lombardi confirmed to G4TV was legit. So yes, this list confirms that Dead Center and Hard Rain will be joining the previously-announced Dark Carnival, Swamp Fever, and Parish campaigns for a total of five different Infected-slaughter scenarios. Just over a month to go until November 17th, people.